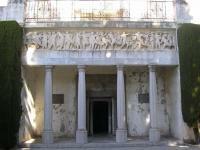 Abadía del Sacromonte is one of the main places touristic interest in the city of Granada. A recommendation that you cannot miss when exploring the spots and streets of this beautiful city where culture and leisure reflect its active history. Be immersed and walk along the surroundings of the accommodation in Hostal Nevot where gastronomy offers unique scents that will increase your appetite in a very special way. Here you have a small guide with the places of touristic interest of leisure, culture that the locality of Granada offers.